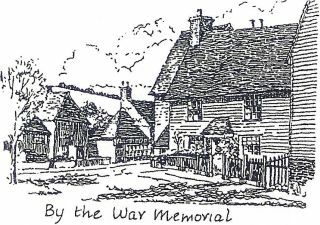 Take an hour or so's stroll and savour the atmosphere of a Kentish village not too much changed over the centuries. Or add another hour and visit the Roman villa and Lullingstone Castle and its Tudor Gatehouse. 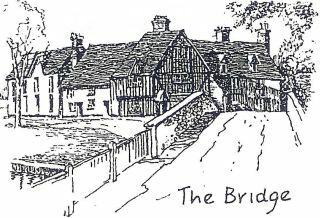 The village probably gets its Saxon name from the ford, Aegen's ford, so, starting from here with your back to the church, cross the 17th Century bridge (look for the projecting stone angel, now nearly obliterated, between the arches on the south side) then walk along Riverside. 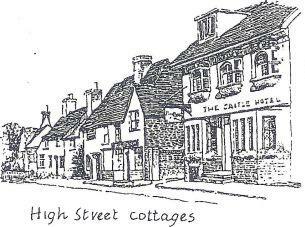 The first building on the right is Tudor Cottage, probably once an inn, with C16 adjoining cottages. Just past the Plough P.H. 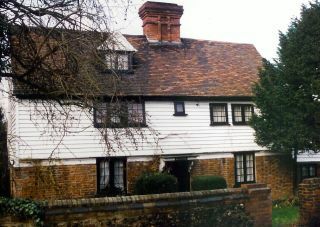 is another C16 jettied cottage, Malt Cottage. 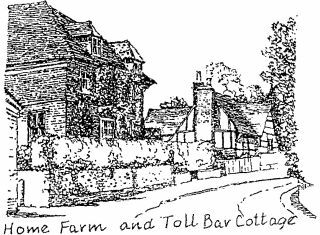 Further up on the opposite side is the square Georgian Home Farm next to Toll Bar Cottage where toll from the main turnpike road was probably collected, whilst more knowledgeable locals used nearby Sparepenny Lane to save a copper. Following the line parallel to the river under the railway viaduct (opened in 1862) brings you in half a mile to Lullingstone Roman villa, the earliest known place of Christian worship in the country (open 1O.00hrs to 16.00hrs daily [18.00hrs in summer]) and continue to Lullingstone Castle with its Tudor Gatehouse (open April to October Sat., Sun., Bank Holidays; 14.00hrs to 18.00hrs). Retrace your steps to Riverside, where a row of saplings may be seen replacing trees blown down in 1987. 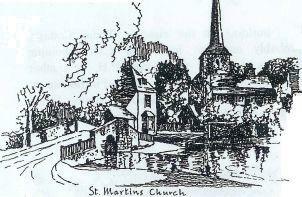 Over the bridge, past Mill House sitting aside the Darent, and once a mill, visit St Martin's Church through its Norman doorway arch. The church was the centre of an historic dispute between William de Eynsford and Thomas Becket. Then turn north for a couple of hundred yards to the High Street. 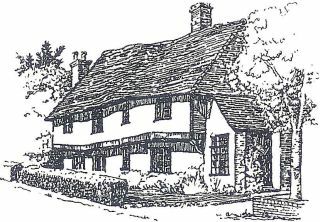 The group of cottages by the War Memorial has changed little and 3,4,5 Elizabeth Cottages form a fine example of a C15 Wealden house. Farther up on the right past the Castle P.H. is an access lane leading to the Village Hall, then to Eynesford Castle, a Norman stronghold of which much of the 30 feet high outer walls still remains. Return to the High Street where a little further to the left is the cottage where the composers Peter Warlock and EJ. Moeran lived in the 20's, and the Baptist Chapel. Back again towards the church, you will pass the Georgian post office opposite the church lychgate. Continue south along Station Road to where it bends and narrows. 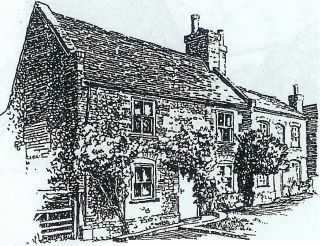 On the left is the old village school and opposite is Willow Cottage, a C17 timber framed cottage once occupied by the artist Graham Sutherland. Farther along on the right are two more old cottages and finally the early C18 Bay Tree Cottage with a front wall of knapped flint. But don't miss the pair of Georgian houses opposite, tucked behind a high red brick wall. Then back to the ford and perhaps to the nearby Common Meadow (toilets by the entrance) where you may care to sit by the river to recover from what we hope was a pleasant trip round the village.